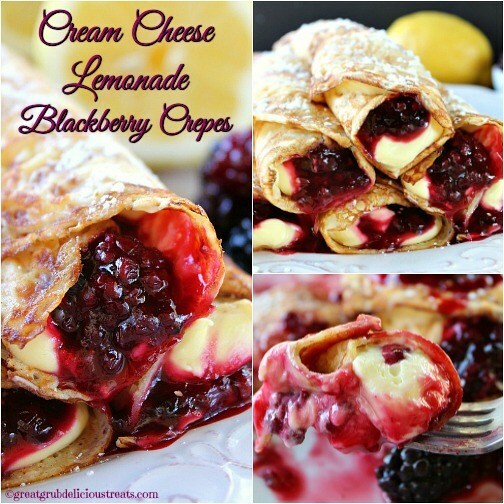 Crepes are so delicious and these cream cheese lemonade blackberry crepes are super delish too! If you are a lover of lemon, and you are a lover of blackberries, then you are going to love these crepes. Crepes are pretty simple to make. One of the tricks is to make sure to swirl the crepe batter around in the pan covering the entire bottom with a very thin layer. Cook for 1-2 minutes and then flip over and cook for an additional minute or so. Place each crepe on a plate until all crepes are made and let cool. 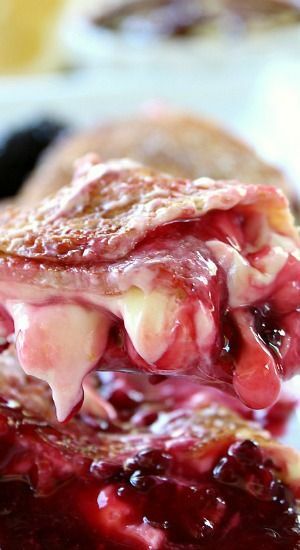 To assemble the cream cheese lemonade blackberry crepes, first, take a cooled, thin crepe and spread cream cheese lemonade filling over the entire crepe. Next, spoon blackberry filling on top of the lemonade filling and roll up. Sprinkle with powdered sugar and continue making and rolling until all crepes have been filled with the delicious cream cheese lemonade filling and blackberry filling. If you have any lemonade and blackberry filling left, either make more crepes or pile the extras over the top of each crepe. Smothering each crepe in these two amazing fillings are totally in the deliciousness category in my book. Blueberries are also delicious mixed with the cream cheese lemonade filling. This filling is from my cream cheese lemonade pie recipe. If you haven’t tasted this pie yet, you seriously need to sink your teeth into this amazing, no bake, delicious, tart, full of lemony goodness, pie! It’s heaven on a plate! In a medium mixing bowl, whisk eggs. Add remaining ingredients and beat on medium speed until well blended. Heat crepe pan, or a medium frying pan, over medium heat. Once pan is hot, spray with a non stick cooking spray or add a small amount of butter. Add 1/2 cup of mixture to pan and rotate from side to side to cover bottom of pan. Cook approximately 1-2 minutes or until edges start to brown. Flip over and cook for an additional minute or so. In a medium mixing bowl, beat cream cheese for 3 minutes. Add lemonade concentrate and beat for another minute. Set aside. In a medium mixing bowl, add lemon pudding mix, and evaporated milk. Beat for 2 minutes, pudding will be very thick. Add pudding mixture to cream cheese mixture and beat for a minute. Put in fridge until ready to use. Add blackberries, sugar, lemon juice, 4 tablespoons water to medium saucepan and bring to a boil. In a small bowl, mix 3 tablespoons of water with cornstarch. Pour corn starch mixture into blackberries and continue cooking until thickened. Smash the blackberries a bit while cooking. Once blackberries are cooked to desired consistency, remove from heat and let cool. 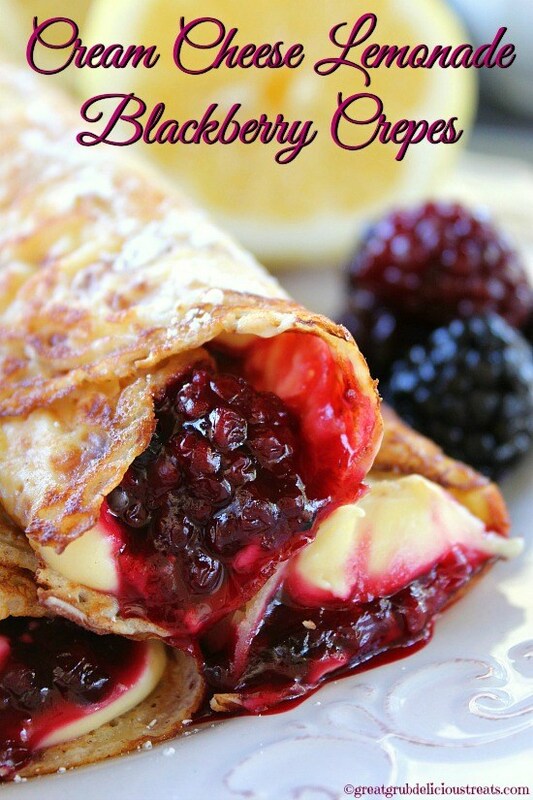 Take one crepe at a time and spread a thin layer of lemonade filling, then blackberry filling, over entire crepe. Roll each crepe and then sprinkle with powdered sugar and enjoy! 0 Response to "CREAM CHEESE LEMONADE BLACKBERRY CREPES"